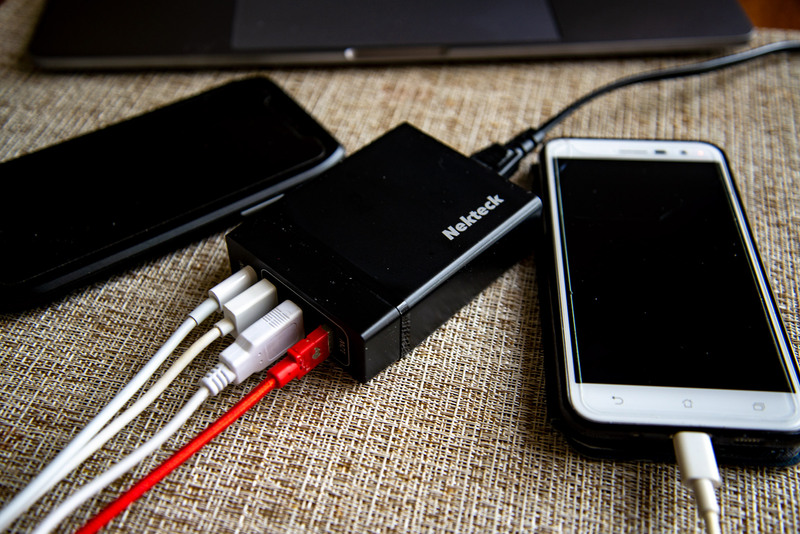 Nekteck’s 4-Port 72W USB Wall Charger with Type-C 60W power delivery is the best travel accessory a mobile warrior can have with them at all times. You can throw it in any bag, as the device is roughly the same height and thickness as Apple’s 13-inch MacBook Pro charger while only being 0.7-inches longer. Featuring three 12-watt USB-A charging ports alongside its USB-C charging port – also includes a USB-C charging cable and a long power cord for those hard-to-reach outlets. 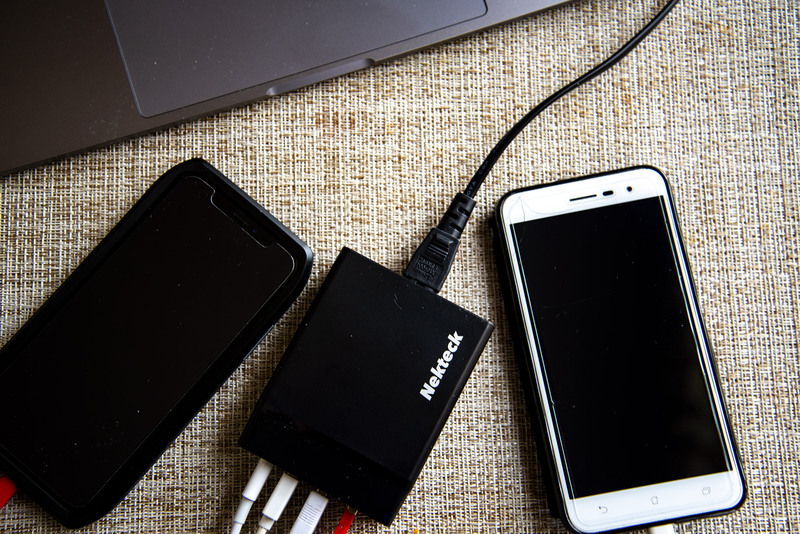 Many new Android smartphones, tablets and laptops are equipped with USB-C charging ports, MacBooks included, so you can simply use this to power them all up. Product page. Read more for our full review. Inside, you get the wall charger, a power cord, and USB-C charging cable. The svelte 15-ounce accessory feels very well-built, despite its plastic casing. We plugged in the maximum number of devices right away to see how warm it would get, and surprisingly enough, even after hours of charging, it was still very cool to the touch. What really sets it apart its competitors is its 60W USB Type-C port. In addition to laptops, tablets and smartphones, even the iPhone X and iPhone 8 can take advantage of the increased Power Delivery charging speed with a USB-C to Lightning charging cable. 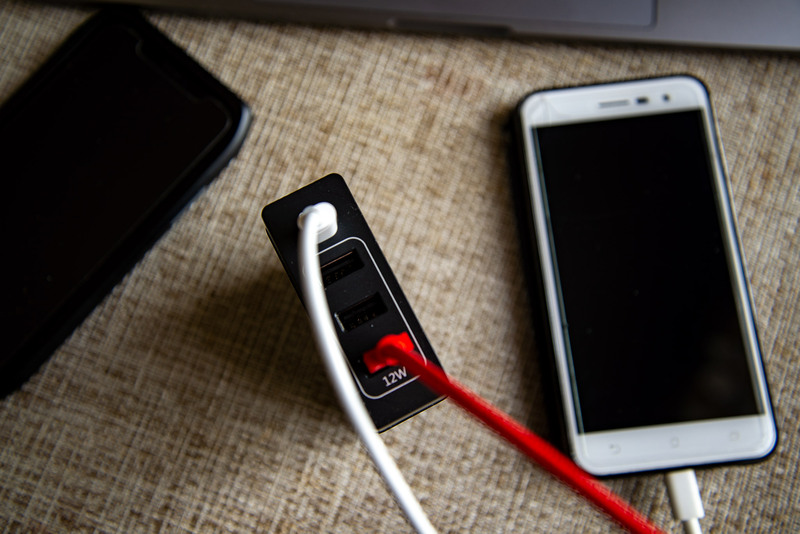 Plus, you also get three USB-A ports with a charging output of 5V/2.4A and since the max output of this charger is 72W, 60W is reserved for the USB-C Power Delivery port, while the 12W of charging is available for the three USB-A ports. Even with four devices plugged in simultaneously, we did not notice much slowdown in charging speeds, if any. Is it worth $35.99? Most certainly, especially considering that most of its competitors are priced anywhere between $40 – $60 for even less features.